Video clip synopsis – It hasn't rained for 18 months and 5,000 sheep have already perished. Farmer Max Russell is desperate to save his remaining flock. He hands them over to a drover. Broadband MP4 drought_bb.mp4 (7.1MB), suitable for iPods and computer downloads. 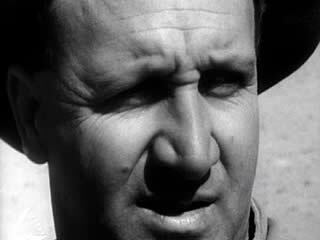 A Farmer’s Life in Drought is an excerpt from the film Drought (4 mins), a segment of the series Australian Diary, produced in 1968. Drought: A look at how grazier Max Russell is affected by drought and copes by sending his sheep out with drovers. Australian Diary is a National Film Board Production. Produced by the Department of Information. Australia is the driest inhabited continent on Earth (Antarctica is the driest overall). Our climate is highly variable – across the continent generally, as well as from year-to-year. Drought is an abnormally dry period when there is not enough water to meet the needs of people in that area. This video clip was taken during a long drought that occurred between 1958 and 1967. In the last two years of that drought there was a 40 per cent drop in wheat harvest, a loss of 20 million sheep, and a decrease in farm income of $300-500 million. One of the effects of drought combined with over-grazing, is to strip the land of vegetation. This can then lead to soil erosion and rising ground water which causes salinity. Write a 50-word summary of the video clip and include what an audience would best appreciate from the video clip. Discuss and identify the message(s) about drought that you think the filmmaker is trying to convey. List as many points as you can from the video clip under the headings: facts, problems and solutions. Write a new 500-word voice-over script that suits a modern teenage audience but keeps the same message(s) about drought and farm work. In two columns, list the images the filmmaker uses to show the effects of the drought on people and animals. Do you think that the music suits the topic? Give reasons why or why not. Brainstorm and list other images you think may have been included to make a more effective film.